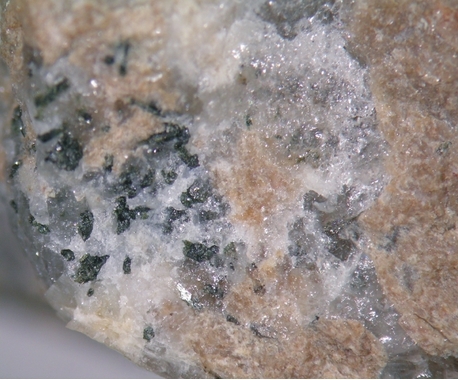 Armstrongite: Mineral information, data and localities. 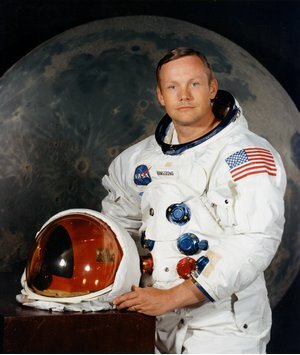 Named after Neil Armstrong (August 5 1930 Wapakoneta, Ohio - August 25 2012 Cincinnati Ohio), American astronaut, who landed on the moon. 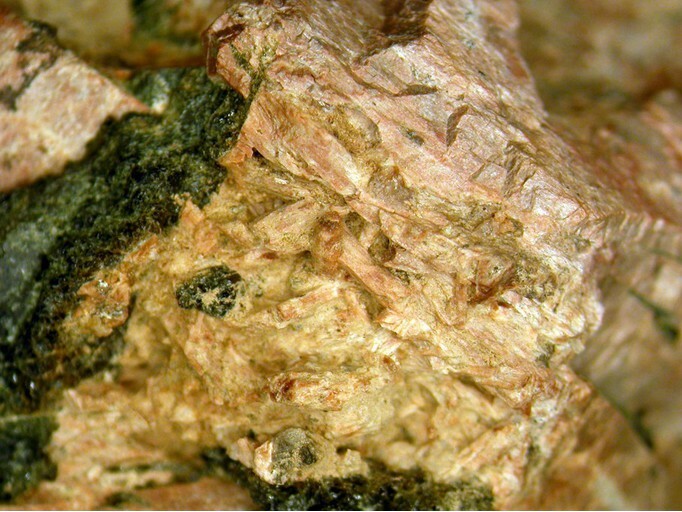 This page provides mineralogical data about Armstrongite. Aegirine 8 photos of Armstrongite associated with Aegirine on mindat.org. Quartz 4 photos of Armstrongite associated with Quartz on mindat.org. Orthoclase 3 photos of Armstrongite associated with Orthoclase on mindat.org. Gittinsite 2 photos of Armstrongite associated with Gittinsite on mindat.org. 72.5.4.2 Elpidite Na2ZrSi6O15 · 3H2O Orth. Vladykin, N.V., Kovalenko, V.I., Kashaev, A.A., Sapozhnikov, A.N., Pisarskaya, V.A. 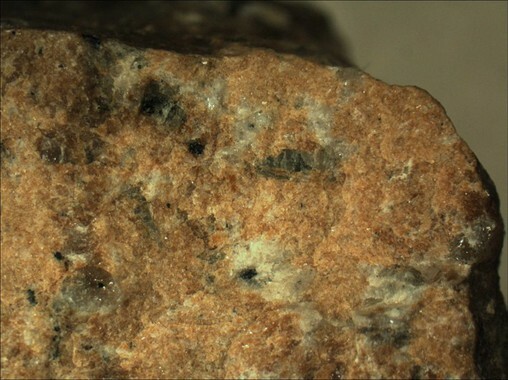 (1973) A new silicate of calcium and zirconium – armstrongite. Doklady Akademii Nauk SSSR: 209: 1185-1188. Fleischer, M. (1974) New mineral names. American Mineralogist: 59: 208-212. Soviet Physics – Crystallography: 23: 593. Kabalov, Y.K., Zubkova, N.V., Pushcharovsky, D.Y., Schneider, J., Sapozhnikov, A.N. (2000) Powder Rietveld refinement of armstrongite, CaZr[Si6O15]·3H2O. Zeitschrift für Kristallographie: 215: 757-761. Jambor, J.L., Roberts, A.C. (2001) New mineral names. American Mineralogist: 86: 1534-1537. Mesto, E., Kaneva, E., Schingaro, E., Vladykin, N., Lacalamita, M., Scordari, F. (2014) Armstrongite from Khan Bogdo (Mongolia): Crystal structure determination and implications for zeolite-like cation exchange properties. American Mineralogist: 99: 2424-2432.
ⓘ Dubbo Zirconia Project (DZP) ? Powder Diffraction Jour. v.2 no.1, March1987; Canadian Mineralogist Vol. 34, pp.349-371 (1996); A. Kerr and H. Rafuse (2012) Rare-earth element (REE) geochemistry of the Strange Lake deposits: Implications for resource estimation and metallogenic models. Newfoundland and Labrador Department of Natural Resources Current Research 2012 pp39-60; BIRKETT, T.C., MILLER, R.R., ROBERTS, A.C., & MARIANO, A.N. (1992) Zirconium bearing minerals from the Strange Lake intrusive complex, Quebec Labrador. Canadian Mineralogist, 30, 191-205. Vladykin N.V., Kovalenko V.I., Dorfman M.D. (1981) Mineralogical and geochemical pecularities of Khan Bogdo massif of an alkaline granites (MPR), - Moscow, Nauka, p. 136 (in Rus.). U. Kempe, J. Götze, S. Dandar and D. Habermann (1999) Magmatic and Metasomatic Processes During Formation of the Nb-Zr-REE Deposits Khaldzan Buregte and Tsakhir (Mongolian Altai): Indications from a Combined CL-SEM Study. Mineralogical Magazine 63:165-177.